Yeah, we don't know anyone who could claim that they don't really like money, if even just a little. It's the stuff that gets you other stuff. And chances are most people know a coin collector or two in their lives. This guy takes that to a whole new level. No, we didn't make a typo. The artist's name who makes hobo nickels is MrThe, and he literally makes a pretty penny. Or nickel. "The hobo nickel is a sculptural art form involving the creative modification of small-denomination coins, essentially resulting in miniature bas reliefs," describes the website. These incredibly intricate works of art are indeed made from real coins, although they are so masterful that they look like their own original creation. MrThe, or Paolo Curcio, was born in Italy and graduated from the Academy of Fine Arts in Spain in 2003. His degree was in sculpting, which then spurred his forray into hobo nickels. Curcio says that his passion for artistic metalworking turned him on to Hobo Nickels. He discovered The Art of Hand Engraving in 2011. "That was when I start[ed] my great interest for this fascinating sculptural type of art and never stop[ped] carving since this day," he said on his website. MrThe is not the first to carve hobo nickels; in fact, the sculptural art form has been around since the early 1700s. The nickel was the preferred coin of choice mostly because of the softness of the metal, but many different coins were altered and made into necklaces or tokens. The Jefferson nickel, in fact, replaced the Buffalo nickel, which was subject to too much wear and actually too soft for a coin in common circulation. MrThe offers carving tutorials on his website to showcase how he completes his work, and inform others how to do the same. He even offers packages of carving tools for purchase on his website. For € 35 Euros or $41 dollars, an instructional DVD on how to make the nickels is also available for purchase. In the 1980s and 1990s, carver Cinco de Arturo introduced more modern design into the art of nickel carving. 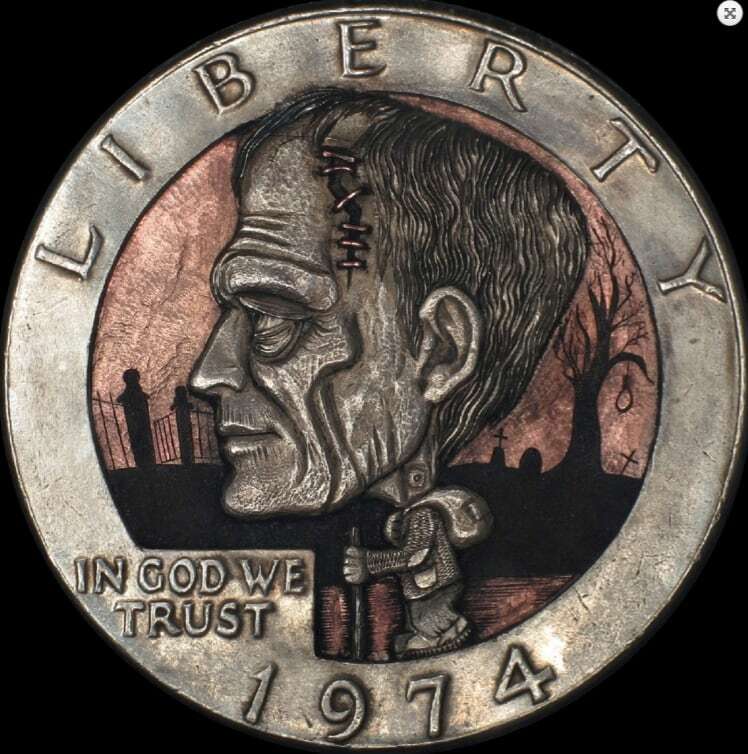 He added cartoon characters and animals to the coins, where typically they only depicted faces. Arturo was one of the few carvers known to have practiced carving Hobo Nickels prior to 2000. With all the designs, the coin is nearly unrecognizable as a nickel at all. However, if you look closely, there is one thing that almost always remains. The word liberty is kept on the nickels in most of the designs out of respect to the original coin. Curcio's site doesn't list specific prices for his carvings. He informs potential customers that they can contact him for a price point. He also encourages others to contact him for ideas and custom projects. Curcio's site also offers links to other websites in the Hobo Nickel world, like Hobocarvers. Their motto? "Defacing currenc for fun & profit since 1913." The site is a forum for all discussions Hobo Nickel based. But wait a minute — isn't it illegal to deface money? Sort of, but with Hobo Nickels, it's okay. "While it is illegal to “fraudulently” alter or deface a coin, the intent of the mutilation is important. For example, machines at amusement parks that flatten and then stamp pennies with a commemorative design are okay because no one could pass the flattened penny off for a real one," writes Collectors Weekly. No one's going to be handing over their nickels to pay for their coffee, so the carving is a-okay. Talk about niche hobbies. The Original Hobo Nickel Society was founded in 1992. Devoted to preserving and appreciating the art, the site showcases many historical Hobo Nickels. You can even sign up for their newsletter. You can donate to the Original Hobo Nickel Society, and the site emphasizes that not all of the donations need to be monetary. The society welcomes donations of old Hobo Nickels. They also seek volunteers to help them work in booths to showcase the nickels. There's an unusual way to spend your Saturday afternoon. In the actual monetary sense, Hobo Nickels aren't worth even five cents. But depending on the maker and the date, some can net thousands of dollars. Most are worth anywhere in the range of $50 dollars to $100 dollars. The name Hobo Nickel was apparently born out of the way that the nickels were made. Designers would actually profile the hobos wandering America and put them onto the nickels. The idea of making currency into something else that was originally minted and engraving them with literal hobo's faces earned them their name. Oftentimes the hobos themselves crafted their own images onto the coins. These original coins have become increasingly rare.